​in the national competition in Charleston, S.C. Questions and enrolling in the seminar: can be directed to program coordinator Rebecca Lewis, 419-898-0014, email rebecca_lewis@fws.gov, or Bob Lund 419-874-3671, email woodcountydecoy@msn.com. ​Ohio Entries must be submitted no later than March 1, 2018, to state coordinator, Rebecca Lewis. The entries are classified into four age groups: K thru 3rd grade; 4th thru 6th grade; 7th thru 9th grade; and 10th thru 12th grade. The winning entry chosen to represent Ohio in the national contest will be selected by a panel of judges at the 41st annual Ohio Decoy Collectors and Carvers Show, Sat., March 10, 2018, at the Holiday Inn, Strongsville, Ohio. Creative students in Kindergarten through grades 12, their art teachers, mentors and parents, are invited to attend a free informational seminar to learn about competing in the 2018 Ohio Federal Junior Duck Stamp Art Competition, Sat., Sept 30, 2017, at the Ottawa National Wildlife Refuge Visitors' Center, 14000 West State Route 2, Oak Harbor, Ohio, 43449. The three-hour seminar will be held from 9 am. to noon, by Ohio Junior Duck Stamp program coordinator, Rebecca Lewis in partnership with the Ohio Decoy Collectors and Carvers Association, and the Ohio Department of Natural Resources – Division of Wildlife. The seminar will include an overview of the contest history and rules, viewing of the extensive collection of mounted waterfowl at the visitors' center, and a walk on the nature trails to observe live waterfowl, weather permitting. Prints and stamps from the Magee Marsh Edwin Dowd Collection will also be available for viewing. To compete in this prestigious contest, students study waterfowl anatomy and habitat, and select a native North American duck, swan or goose from the approved list as specified in the rules. The physical size of the final artwork must be 9 inches by 12 inches and no more than 1/4 inch thick. Design entries must be a live portrayal, and must be the contestant's original, hand-drawn creation and may not be traced or copied from photographs, or computer or mechanically generated. A variety of allowable medium and techniques are specified in the rules. A conservation message written by the contestant must accompany the artwork. Ohio Entries must be submitted no later than March 1, 2018, to state coordinator, Rebecca Lewis. The entries are classified into four age groups: K thru 3rd grade; 4th thru 6th grade; 7th thru 9th grade; and 10th thru 12th grade. “The winner of the Ohio Federal Junior Duck Stamp Competition will go on to compete at the national level against entries from every state and several U.S. Territories. Judges will also choose a winning conservation message and second and third place artwork,” said Ms. Lewis. “We suggest that students bring a sketch book to the seminar along with binoculars or a scope to view the ducks and geese,” said Bob Lund, ODCCA president. The Federal Junior Duck Stamp Conservation and Design Program is a dynamic art and science-based curriculum that teaches wetland and waterfowl conservation to students in kindergarten through high school. The first national competition was first held in 1993. The winning artwork serves as the design for the Federal Junior Duck Stamp and is sold for $5 with proceeds going to support recognition and environmental education activities for students who participate in the program. 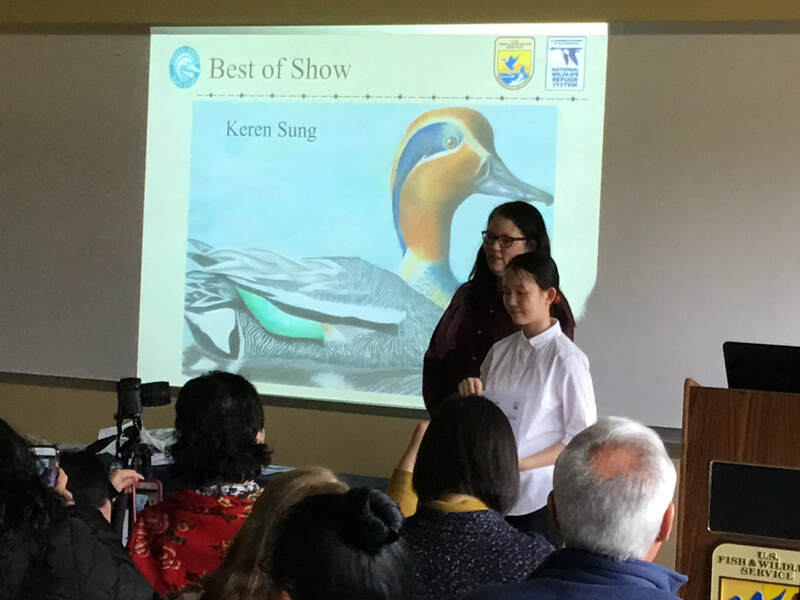 The 2017 Ohio Best of Show winner was Keren Sung, age 13, Dublin Ohio, for her green-winged teal in color pencil which qualified her to compete in the national competition in Charleston, S.C.
​or Bob Lund 419-874-3671, email woodcountydecoy@msn.com.